The following article appeared in the Observer ahead of Aleida Guevara's 'Remembering Che' tour. She has the eyes of her father, a gaze that became an emblem for the 20th century. She also has his deep sense of social injustice, but Dr Aleida Guevara has always had to share her "papi" with the world. While she doesn't mind the posters, the flags, the postcards, graffiti paintings and T-shirts, Dr Guevara and her family are trying to clamp down on "disrespectful" uses of her father's famous photo, taken by Alberto Korda in 1960. Not easy when it is the most reproduced image in the world. "It's not so easy, we do not want to control the image or make money from it, but it is hard when it's exploited," Dr Guevara smiles. "Sometimes people know what he stands for, sometimes not. Mostly I think it is used well, as a symbol for resistance, against repression." Che on a bikini was one they couldn't stop, but Che, a teetotaller, on a vodka bottle was a battle won for the family with the help of the UK Cuba Solidarity Campaign. Next month marks the 45th anniversary of the killing of Ernesto "Che" Guevara, the guerrilla who helped lead the Cuban revolution and became an icon of rebellion. This year is also the 50th anniversary of the US "blockade", the ongoing commercial, trade and travel embargo which has stifled Cuba's economy. The cold war era-style standoff still sees America spend millions beaming propaganda radio and TV stations into Cuba. Cubans remain the only immigrants the US encourages in with automatic citizenship. An underdeveloped country offering world-class education and healthcare for all, Cuba maintains anti-dissident policies, imprisoning journalists and anti-government activists. Despite a mass prison release of dissidents in 2011, Cuban authorities, says Amnesty International, "do not tolerate any criticism of state policies outside the official mechanisms established under government control. Laws on 'public disorder', 'dangerousness' and 'aggression' are used to prosecute government opponents. No political or human rights organisations are allowed to obtain legal status." Dr Guevara is in the UK for another anniversary, the 14th year since the Miami Five – spies entrusted with infiltrating anti-Castro terrorist groups operating from Florida – were jailed by the US. The 51-year-old Havana paedriatician will lead an evening vigil in London outside the US embassy on 18 September. "I'm not political," she insists, "but I care about injustice." Aleida was seven when Che was killed in a remote Bolivian hamlet by a group of Bolivian soldiers and CIA operatives. With only shadowy memories of her father, she has got to know him through his diaries and the reminiscences of others, including the man she calls "Uncle" – Fidel Castro. "Fidel has told me many beautiful stories about my father, but I cannot ask him too much, he still gets very emotional at the thought of Che. For example, my father had terrible handwriting, so my mother was asked to transcribe his diaries. When Raúl Castro came to our house to collect the manuscript, my mother knew that Raúl and Fidel also kept diaries, so she said 'if there are accounts in the diaries that differ then you must go with Che's, because he is not here to defend himself'. Raúl got very angry and said 'No, while Fidel and I are alive, Che is alive. He is always with us.' They were crying then. "If Che hadn't died in Bolivia, he would have died in Argentina trying to change things there," she says. "Maybe it would be a different continent today. My mother always says that if my father had lived we would all have been better human beings." Che was a medical student in Argentina when, on a motorcycle tour around Latin America in 1952, he became incensed by the poverty he saw. He took up political theorising and then arms, joining the revolution that overthrew Cuba's vicious Batista regime. It was then, as the middle class and wealthy fled Cuba for Miami, that a bitter chasm opened between the two nations, and it has deepened from president to president. The promise of President Obama to tackle the Cuban issue has come to nothing so far. "We had great hopes, but we are disappointed in Obama, maybe things have even got worse for us," Dr Guevara says. Revolution, she believes, simmers on in Latin America, where the gulf between rich and poor is escalating and she blames, as Che did, creeping American-led industrialisation. "This economic crisis is even more dangerous than any before for Latin America. It's not only about oil now, the US want water too. Brazil is destroying its rainforest to mine out iron, Mexico is a dumping ground for unwanted waste. This time the land is being destroyed as well." Critics of Che claim the photogenic young man in battle fatigues who wrote poetry overshadows the brutality of his revolution. Guevara showed no qualms about killing. "It was a revolution," says his daughter. "Of course, I would rather there was no bloodshed but that is the nature of revolution. In a true revolution you have to get what you want by force. An enemy who doesn't want to give you what you want? Maybe you have to take it. My father knew the risk he took with his own life. "I was angry, of course, growing up without a dad, but my mother always says, love your father for who he was, a man who had to do what he did. My father died defending his ideals. Up to the last minute he was true to what he believed in. This is what I admire." But she says she would like to have been able to argue with him. "When I was six he sent me a letter. In it he said I should be good and help my mother with household chores. I was angry because my brother's letter said 'I will take you to the moon' and my other brother's read 'We will go and fight imperialism together'. I was annoyed – I wanted to go to the moon, why couldn't I fight imperialism?" Dr Guevara is the eldest of Che's four children with his second wife, Aleida. 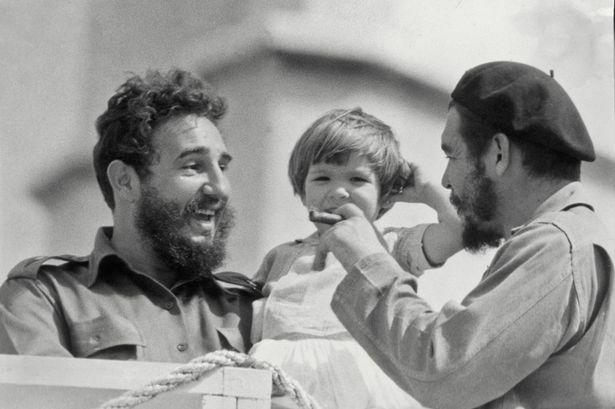 "We didn't have privileges growing up as Che's children. My colleagues didn't know who I was until I first talked on Cuban TV in 1996. But it's important not to keep silent, because there is injustice being wrought." Last chance for justice for the Miami Five?